Jesus' resurrection changed everything! The women who were so faithful to him through the crucifixion and resurrection are there, obediently praying in expectation. As we might expect, Jesus' mother is there praying as well. But look carefully and you will see Jesus' brothers, once doubting and ridiculing him, now praying in expectation of their risen brother's release of power through the outpouring of the Holy Spirit. Yes, they are waiting, but not idly waiting. Yes, they are praying, but they are also expecting the great work of the risen Jesus which will be done through them! God does amazing things when people who love the risen Jesus pray with expectation. So what are you waiting for? 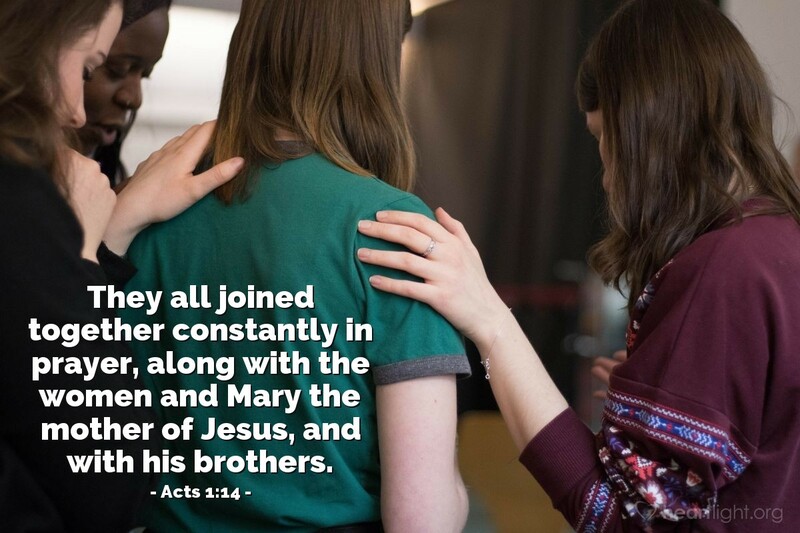 Get with a group of those who love Jesus, and pray with expectation for God's work to be done through you. Almighty and All-powerful God, please bless my efforts as I seek to encourage others to join me in fervent prayer. I pray that you will bring revival among those who call on your name and a stirring among those who are hungry, but don't yet recognize their hunger is for Jesus. Please bring revival to your people and an outpouring of grace to those who need to know Jesus as their Savior. In Jesus' name I pray. Amen.